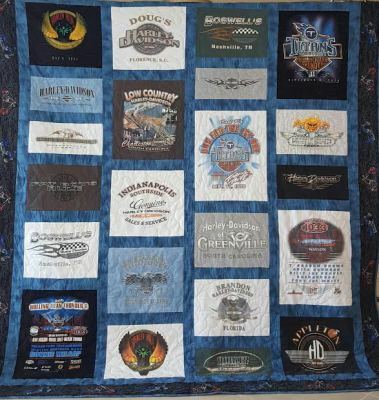 ​​​​We make custom quilts and blankets out of your t-shirts! 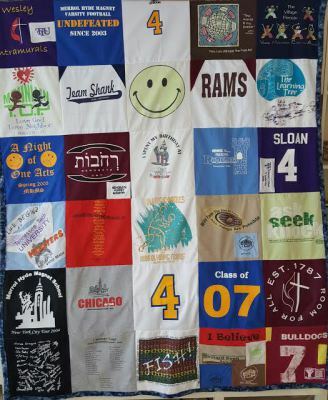 This "Blended Style" memory quilt has sashing between each t-shirt square as well as around the edges. 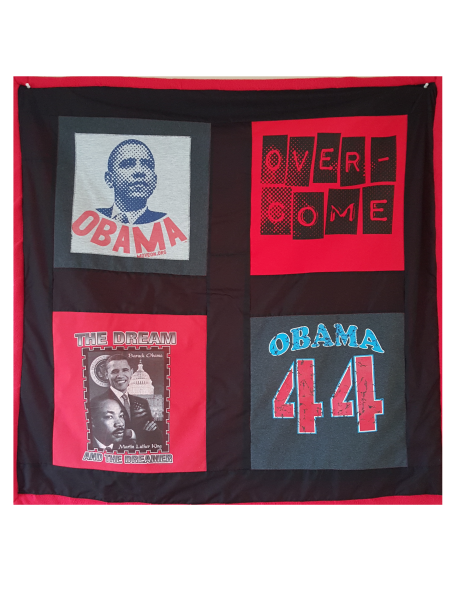 This particular quilt has a 4X5 square design with a slight modification to the middle row to preserve the integrity of one or more t-shirt designs. The back is finished with anti-pill fleece and quilted with a "stitch in the ditch" technique to hide the seam on the face of the quilt while allowing it to show on the back. This is the next "most expensive" blanket/quilt due to the addition of the sashing and border. 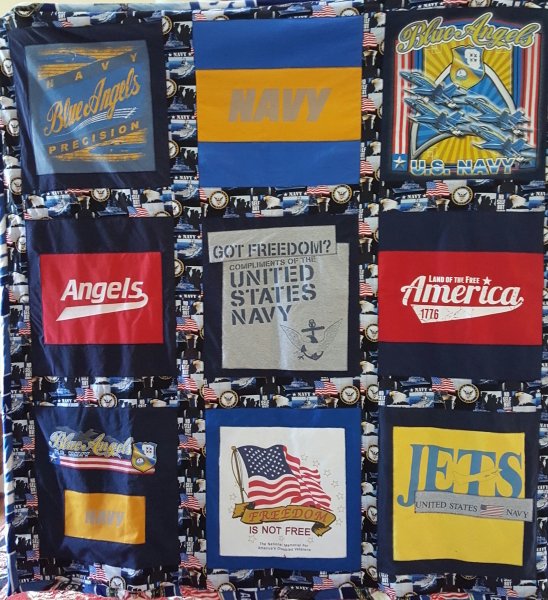 The "Traditional Style" memory quilt has sashing between each t-shirt square as well as around the edges. This particular quilt has a staggered pattern to the squares to preserve the integrity of the designs on each shirt used. It is finished with flannel on the back and quilted with "Harley" badge patterns throughout the design. This is the most expensive style blanket/quilt, requiring long arm quilting in addition to the sashing. 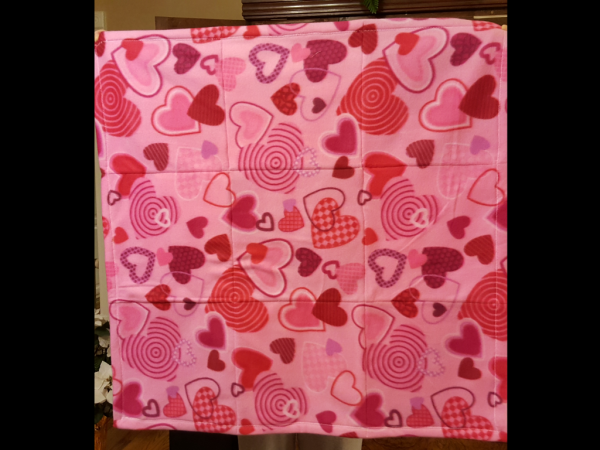 This "Contempory Style" blanket has a 5X6 design with t-shirt squares sewn directly together with no sashing between. This style lends itself well to "highlight" patches cut from sleeves, pockets, or other shirts. The back is finished with anti-pill fleece and quilted with a "stitch in the ditch" technique to hide the seam on the face of the blanket while allowing it to show on the back. This style allows use of many shirts but is less expensive than a traditionally quilted product. Win win! This is the least expensive style blanket/quilt. Please check out the "Products" page for items for sale! Great Prices! Easy to Understand! Regardless of how you want your blanket/quilt to look, we'll quote you a price that will likely please you. So you know, we searched the internet, compared prices, and found that we can offer you the product you want for a great price. Personalization is the key. It doesn't get any better than that! 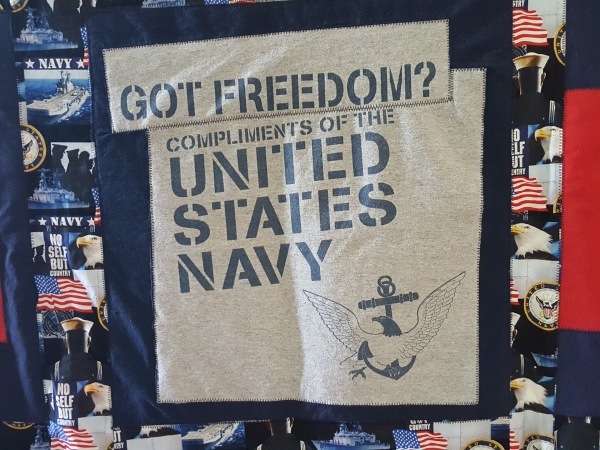 All you have to do is tell us how you want your blanket/quilt to look and we'll make it for you. Look at the three examples above to get a beginning idea and then call us. We'll be happy to baby-step you through the process. If you want us to just do it all from start to finish, all you have to do is mail us your shirts. We're getting pretty good at this! No Worries! Your T-shirts are Safe with Us! Fast! We Start Your Quilt Immediately! We know your T-shirts mean the world to you. You love them! That's why you saved them. We will give your shirts the same care you have. In fact, we are honored that you have chosen us to make your blanket/quilt. Being sure your shirts are safe and used as you have directed is our first priority. From the moment your shirts arrive, we start organizing the squares, sashing, fleece, flannel, and any special pieces you want added as highlights. Once we assemble the blanket/quilt according to your instructions, we'll let you see it before the final stitching. You are quality control! Sweet! Please check out the "About" page to get to know us. Follow these steps in order, more or less, and you will cover the bases for getting your blanket/quilt completed. It is important to complete each step carefully for recording purposes. For example, at Step 6., submitting your personal information after mailing your shirts is needed to match received shirts with your order. If you have questions at any step, you can find detailed information about the subject on these 4 pages. Much of it is in the section below these steps. Just call if something doesn't make sense to you. 615-886-0999. Decide what size you want: Throw, Twin, Full, Queen, or King. Decide which style you want: Traditional, Blended, or Contemporary. 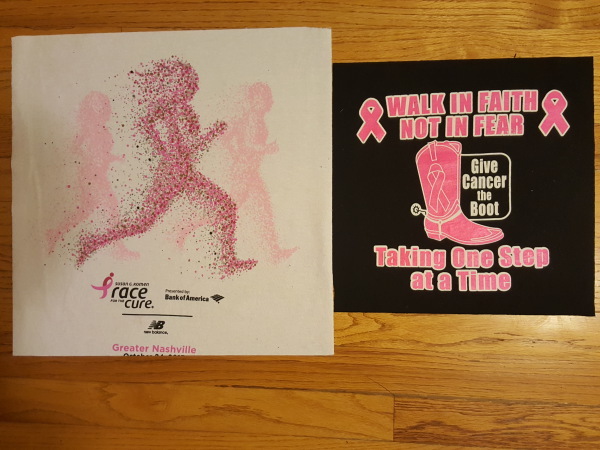 Decide which, if any, personalizations you want: single color or designer fleece, single color or designer sashing, photo(s), embroidery, writing, patches, emblems. Do not cut your shirts. We will do that. If you want to arrange them like you want them to appear when assembled, do so and photograph the assembly. If you have any pocket/sleeve emblems that you want on a larger square you may cut them and position accordingly in the photo. 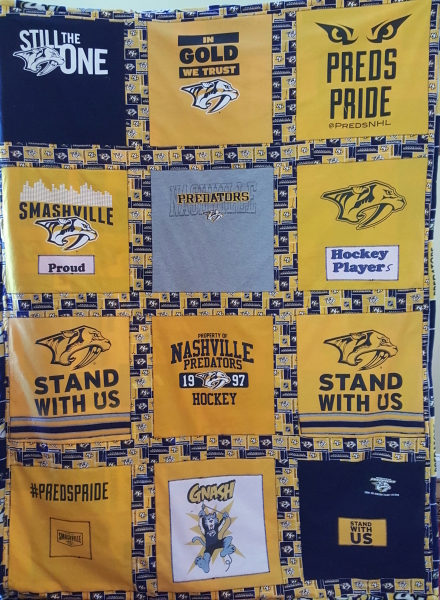 Call 615-886-0999 to notify us you have prepared shirts for your blanket/quilt. We'll answer any questions you have about the process. We'll talk about the backing and sashing you want. We might ask you to text or email your photo for the discussion. 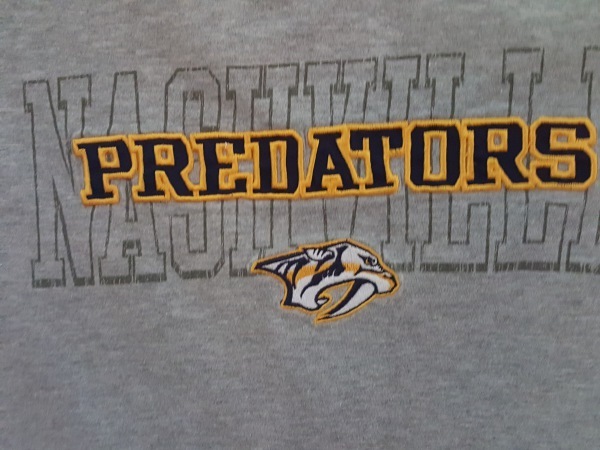 Mail your shirts via a means of your choice to 1506 Dickerson Bay Drive Gallatin, TN 37066. Shoot us a text or e-mail to let us know they're on the way so we will be expecting them. We'll notify you when we receive your shirts. We will assemble them as directed, and to make sure we've got it right, we'll text or e-mail a photo for approval before final assembly. When your blanket/quilt is complete we'll send you an invoice for payment. 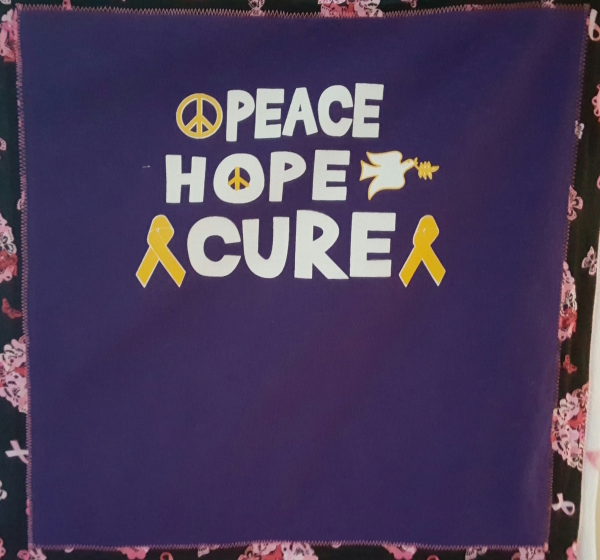 After we receive payment, we'll mail your blanket/quilt to you free of charge. 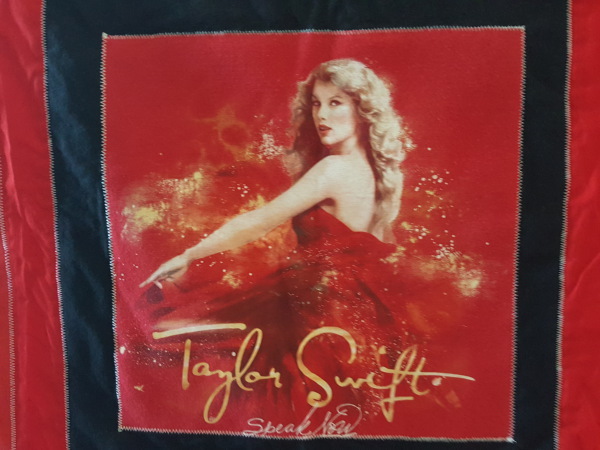 Fleece for blanket or flannel for quilt. If you want the 'Blended Style Throw' we recommend fleece. For the larger items, flannel makes an excellent backing! Have a theme, such as the sport you play(ed)? Most often there are designer fleeces to fit the design. See our 'Products' page on this site for examples. Nice! Throw them in a box and mail them to us. We'll take care of everything! How easy is that? 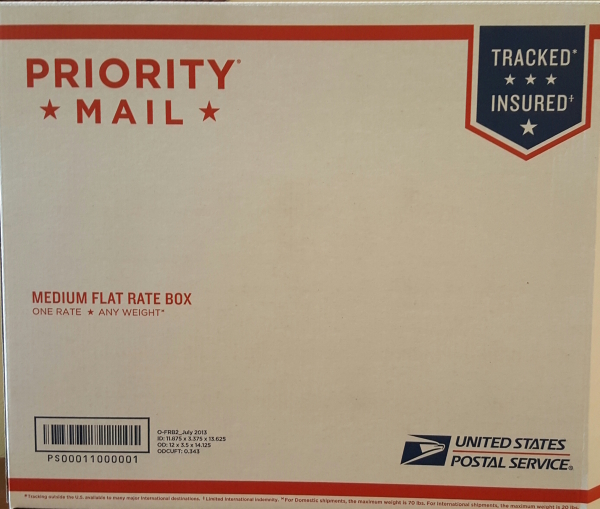 Send via whichever mail service you like, however, we recommend tracking and insurance. The size of the design on a t-shirt determines the size of the square. Most adult sizes will be 16. Children's will be 12, but either can be a combination of sizes. The square to the left is 16 inches. The square to the right is 12 inches. A 12 inch, or any size square actually, can be sewn onto a larger blank as needed. 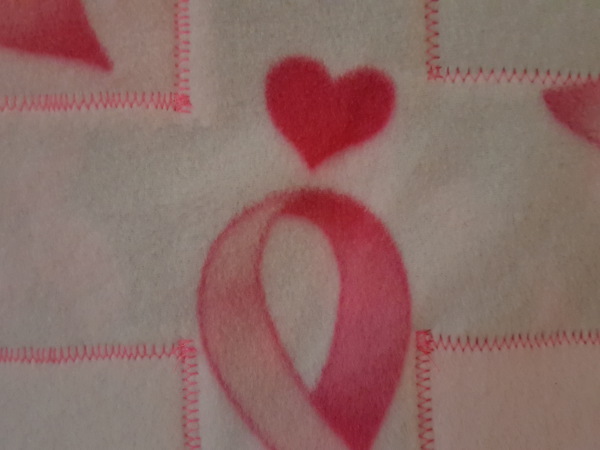 Embroidery, Photos, Written Messages, can be integrated into your blanket/quilt to personalize them to your taste. 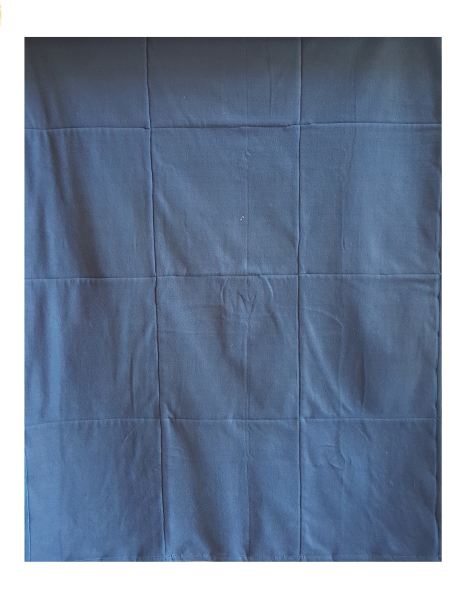 Sashing, borders, badges, batting, backing stabilizer, etc. You don't need to worry about this, but if you really want to know, call 615-886-0999. Send money to [email protected] at Paypal. 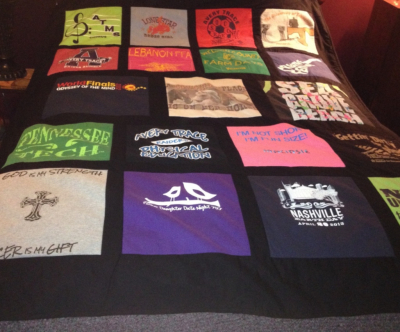 Send check payable to The T-shirt Quilt. Co.,1506 Dickerson Bay Dr, Gallatin TN 37066. We also do Venmo and Zelle. Machine wash blankets/quilts in cold water on regular cycle. Tumble dry low. Do not over dry.